1st – Meet the Snowman (The Snowman from the animation!). Break out Baby’s Christmas jumper. 24th – Visit Festive lights in town. She will have her Christmas teddy as well. I am also going to take part in the #elftakeover. This comes from the Elf on the shelf tradition. The Elf ‘arrives’ on 1st December to observe the children and report back to Santa. The children cannot touch the Elf or the magic will be broken and the elf does not move when anyone in the house is awake. Each morning the children have to find what the mischievous Elf has got up to at night. On Christmas Eve the Elf returns to help Santa and leaves the children a note and a goody bag (including Christmas PJ’s, DVD, whatever you wish). 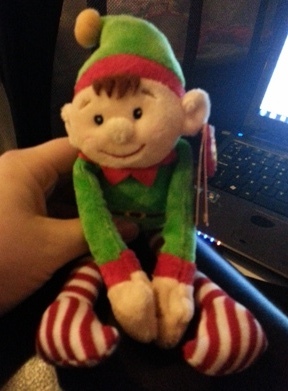 As part of the #elftakeover I am going to take photo’s of what our Elf ‘Eli’ gets up to and blog and tweet about it. In a few years time baby will have lots of fun trying to find the ‘Eli’, but for the next couple of years it will entertain me and Mr Hubby. I know she is too young to really know what’s going on this Christmas, but I will enjoy doing these things with her and will put the keepsakes in her keepsake box for when she is older.